July, Saturday 30, 1864 5 miles West of Atlanta Ga. Little or no fireing to day our Corps is geting in to regular order on the line to day our Brigade move 1/2 a mile to the right to day and [furnish?] a Camp expecting to remain there for several day. in the after noon our Regt. was orderd out on the flank a distance of 3 miles on the right as [picks?] 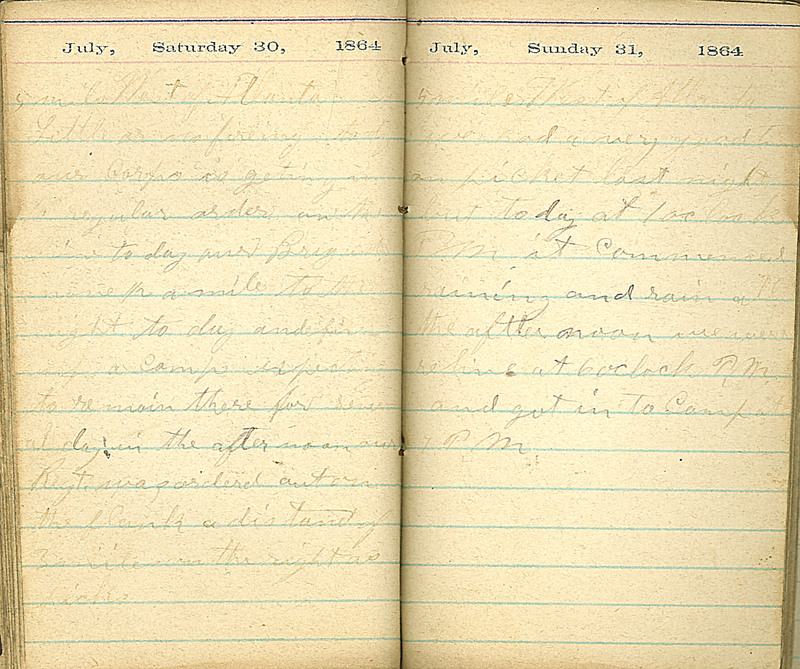 July, Sunday 31, 1864 5 miles West of Atlanta we had a very good time on picket last night but to day at 1 oclock PM it commenced raining and rain all the after noon we were relive at 6 oclock P.M. and got in to Camp at 7 P.M.